Business Analysis is a practice that involves a set of tasks and techniques to work as an association among stakeholders in order to understand the structure, policies, and operations of an organization. Business Analysts play an important role in the growth and fast development of the company. An effective and successful Business Analyst needs the right instruction and communication skills. Undoubtedly, Business Analyst is a promising career as compared to rest of the other jobs in the market. Certifications like CBAP® (Certified Business Analysis Professional) give recognition of competency, show commitment to the profession, and help the candidate with job advancement. Apart from the work experience, you need to have excellent practical knowledge of the business analysis concepts to pass the CBAP® exam. There are training organizations like Multisoft Systems that provide CBAP® Training to give you a thorough understanding of these concepts. 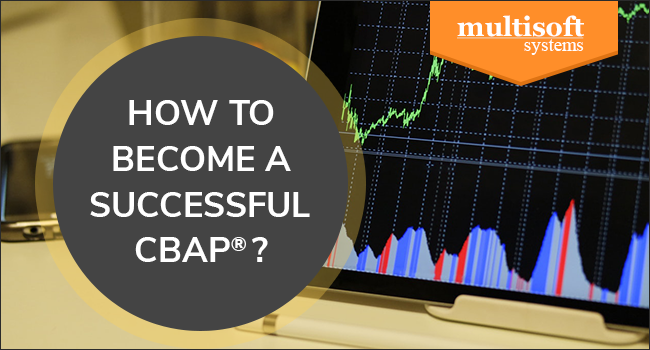 Here are the steps you need to follow to become a successful CBAP®. In order to apply for the CBAP® certification exam, you must possess 5 years of experience in the role of business analyst, as defined by the BABOK® Guide. You must also demonstrate 900 hours of journey across 4 to 6 knowledge areas. PDs define the type of coursework required as one of the many requirements to sit for the CBAP® exam. To qualify for PDs, the CBAP® training must involve meaningful interactions with the instructor and cover a BA topic included in the BABOK® Guide. CBAP® applications are submitted to IIBA®. While applying, you need to submit the minimum education requirement (high school or equivalent) proof and two references. You can find all the information on the IIBA® website. To crack the CBAP® certification exam, you need to understand the content of the BABOK® Guide. Qualifying this exam demonstrate your knowledge and application of the material. If required, you can also join study groups that focused mostly on reading and discussing the BABOK® Guide contents. Getting a formal training from Multisoft Systems can help you to prepare faster and also in a streamlined manner. Multisoft is a renowned training organization that provides the best CBAP® Training in Noida. They conduct highly interactive learning sessions to clear all the doubts regarding the subject. Certified trainers provide tips and tricks to crack the CBAP® exam. Before starting the training, schedule the exam for 2-3 months out. In case you do not take the exam or do not pass, you can always reschedule the exam within one calendar year. Give your best on the big day and celebrate your success.